Delicacies are sourced from local small-scale producers and suppliers and seasonal raw foods are brought fresh onto the ship each day. In fact, more than 80% of the produce taken on board is procured directly from indigenous and local producers. Being a coastal voyage, seafood often dominates the menu. 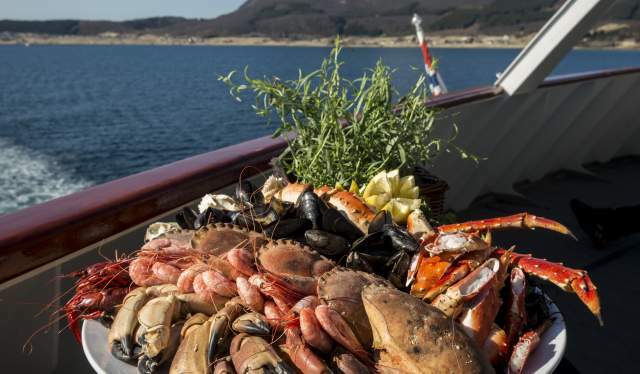 One of the highlights for many of those on-board is the ‘seafood buffet’ which includes a smorgasbord of locally caught fish and shellfish, including the infamous King Crab. These creatures which can weigh up to 8 kilos are exported around the world, but nothing beats tucking in just a few hours after it has been caught in the surrounding waters. Join the King Crab safari excursion and you can even catch your own, before it is cooked for your lunch. One of the highlights for many of those on-board is the ‘seafood buffet’ which includes a smorgasbord of locally caught fish and shellfish, including the infamous King Crab. These creatures which can weigh up to 17 pounds are exported around the world, but nothing beats tucking in just a few hours after it has been caught in the surrounding waters. Join the King Crab safari excursion and you can even catch your own, before it is cooked for your lunch. Bon Appétit, or as the Norwegians say God Appetitt! 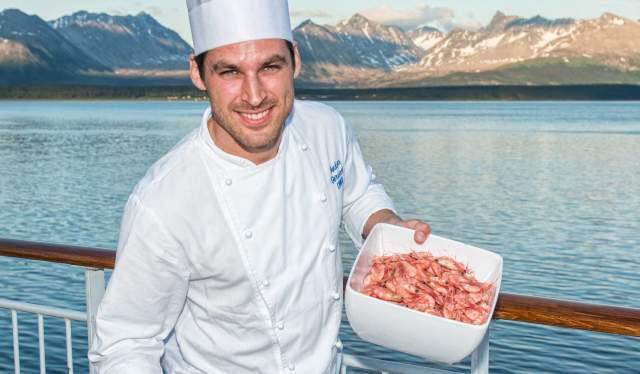 If you are celebrating a special occasion while on-board, or simply want to treat yourself to a special meal, then Hurtigruten’s a la carte menu offers mouth-watering alternatives in a more exclusive restaurant. One of the chef’s favourite starters is the scallops. They are hand-picked by divers and delivered while they are still alive by a local lady who lives on the coast of Helgeland. The chef then cooks them with a cauliflower cream and locally made chorizo.